● onions — 2-4 PCs. ● the mixture of peppers — 0.5 tsp. 1. Cut the meat into small pieces. Add a mixture of peppers, the seasoning, 1 tablespoon of vinegar and lemon juice. All carefully stir and leave to marinate 2 to 6 hours in the cold. 2. Slice the onion rings. Add 2 tablespoons vinegar, 1 tablespoon sugar and 4 tablespoons water. Leave to marinate for 1 hour. 3. To prepare the sleeve for baking. Tie with one hand. Spread on the bottom of the pickled onions. On top lay the meat. 4. Tie the sleeve on the other side and make 2-3 puncture at the top of the package. Put in a preheated oven until t 250° C for 50 minutes. 50 minutes to get a sheet and cut a sleeve for roasting meat. If necessary, you can pour the separated juice. And again put in the oven for 30 minutes. 5. Kebab in the oven on a bed of onion ready. ● Tomatoes — 2 PCs. 1. Select a smooth (rectangular), dense piece of meat (like pork). On the meat to make cross cuts, not dorezaya to the end. 2. Mix ingredients for marinade and brush the meat on all sides and in the notches, to taste salt, pepper. 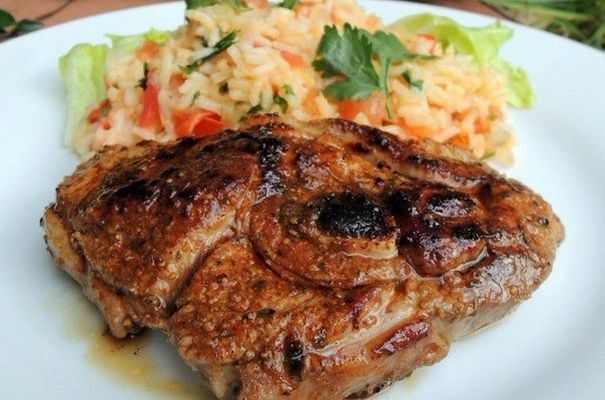 Leave the meat to marinate for 10-12 hours. 3. Sliced cheese and rings the tomatoes, chop the garlic. In each incision to put cheese, tomato and garlic. If desired, add sliced mushrooms. 4. 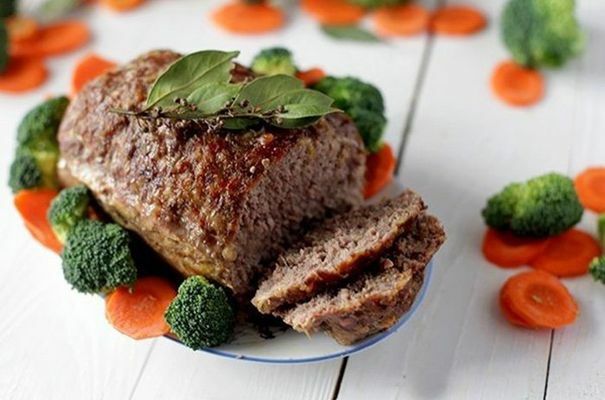 Meat wrap in foil, place on a baking sheet and place in preheated oven to 180-200 C and bake until tender 50-60 minutes. 5. Prepared meat out onto a plate and decorate with greens. You can make potato mushrooms. 2.Mushrooms (my forest) fry with onions, salt, pepper and 1 teaspoon mayonnaise. 3.Cheese grate on a coarse grater. To it add the chopped garlic, 1 tbsp mayonnaise, 1 egg (uncooked), salt, a pinch of curry and turmeric (in principle you can use any seasoning). Mix well. 5.The slices of meat lay on a greased baking tray, then around the edges of the sliced tomatoes, mushrooms. Top gently laid egg and cheese mixture. 1. Peel potatoes and cut into slices. Meat cut into pieces and repel. Onions cut into rings, finely chop the mushrooms and grate the cheese. 2. Prepared ingredients put in the baking pan in the following order: potatoes, meat, onions, mushrooms. 3. All sprinkle with cheese, cover with mayonnaise, place in the preheated oven and bake until Golden brown. ● Onions – 2 PCs. ● Milk (I have 2.5% fat) – 600-700 ml. ● Tomatoes – 2 PCs. 1.Pork cut into pieces of arbitrary size and put in a baking dish. Season with a little salt and pepper if desired. 2. Onion peel and cut into half rings. Spread on pork. 3. To prepare the Bechamel sauce. To do this in a frying pan with a thick bottom on low heat, melt 100 g of butter, add to the oil 3 tbsp with slide wheat flour. 4. The flour and butter, stir thoroughly to avoid lumps. 5. In oil-flour mixture in a thin stream, add milk, salt and pepper sauce, add a few pinches of nutmeg. Sauce cook, stirring, until thick (consistency of runny sour cream). 6. Ready sauce to baste the lamb with the onions (use about one third of the sauce). 7. Raw mushrooms arbitrarily cut and put a layer of meat with onions, pour third of the sauce. 8. Tomatoes should be cut arbitrarily, put a layer and pour the remnants of the sauce. 9. Cheese grate and sprinkle them over the dish. Pork roast for 45-50 minutes in the oven at 180 degrees. 10. Pork can serve as a separate dish, and can be a side dish. I have on the side – boiled potatoes with oregano. 3. RUB cheese on a coarse grater. The part of the layer of meat with tomatoes (about 1/3). 4. Mushrooms spread on cheese, you can pre-not thaw. Then pour mayonnaise (in very moderate quantities), sprinkle with salt and top with remaining cheese. Put in oven at 200 degrees for 20 minutes.If you use fresh mushrooms (sliced), then this dish looks neater – the mushrooms under the cheese does not stick out.